NumberLine2 is the new version of the award-winning Number Line app to help students learn about fractions, decimals, and percents. 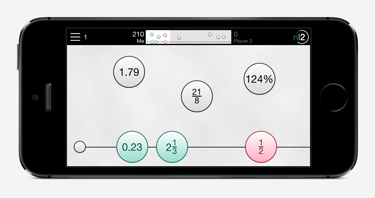 NumberLine2 has been redesigned for iOS7, iPhone5, retina display iPad, and Game Center. Teachers and educators buying 20 or more copies receive a 50% discount by purchasing through Apple's Volume Purchase Program for Education. To Find NumberLine2 on the Volume Purchase Program Store, click here.